How did we get from 20-foot-long maps to GPS devices small enough to fit in the palm of our hands? How does GPS work and what can it tell us? How do ancient mapmaking techniques used by the Romans and Greeks influence the satellite technologies we use today? The history of mapmaking is full of remarkable characters who charted the unknown with an ever-changing set of tools. 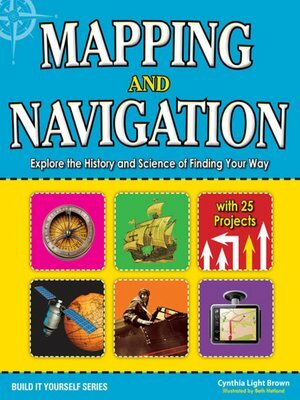 In Mapping and Navigation: The History and Science of Finding Your Way, kids ages 9–12 will learn the history and science behind the evolution of mapmaking, and how much is still out there for discovery. Readers will explore ideas through hands-on experiments while learning new terminology and interesting facts. Projects include using triangulation to measure distances, creating contour lines on a mini-mountain to understand elevation changes on a map, and inventing a sundial and compass to understand the basics of navigation. Whether mapping the solar system or mapping their own backyard, all readers will be able to understand mapping technologies and see the world in new and exciting ways.